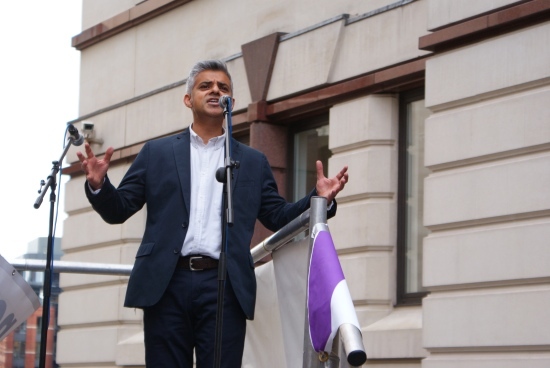 Labour’s Shadow Lord Chancellor Sadiq Khan MP relished attacking Chris Grayling in his “Rally for Legal Aid” speech outside the Old Bailey yesterday. Grayling, he said, was a man with no idea of our history who believes “if you are charged with a criminal offence, you are a criminal”, that if a judge finds against the government “you need to move the goalposts, and change the rules of judicial review”, and that all lawyers are “fat cats, chasing ambulances”. I was interested though that Khan picked out only two aspects of the government’s legal aid proposals for specific criticism – which may give us some indication of how policy might be different if Sadiq Khan heads the Ministry of Justice in two years’ time. He focused on the idea of criminal defendants being “too thick to pick” – so clearly he’s in favour of retaining a client’s choice of his or her legal aid solicitor; and he referred to a number of cases like those of Jimmy Mubenga, Jean-Charles de Menezes and the Gurkhas in which legal aid has enabled foreigners to challenge state action. He did also specifically mention judicial review – but it wasn’t obvious to me that he was signalling definite opposition to the government’s proposals on legal aid for judicial review, rather than its changes to the judicial review procedures themselves.